Herbal medicine is a natural, non-toxic way to treat many conditions of ill-health. It is holistic, meaning it treats the whole person, embracing all levels of an individual: physical, mental, emotional and spiritual. The majority of the world's population relies on herbal medicine as its primary form of treatment, and indeed most modern drugs originate from isolated phytochemicals (phyto – plant: a phytochemical is a chemical constituent of a plant). 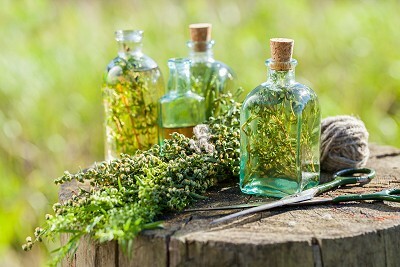 Herbal practitioners believe that using the whole herb, as nature intended it, rather than a single chemical is a more effective method of treatment. Dandelion leaf, for instance is an effective diuretic herb. Drug-based diuretics, while achieving a similar effect, deplete the body of potassium and may require supplementation. Dandelion is naturally very high in potassium, thus providing a balanced medicine, naturally. Phytochemicals have an enormous scope, including: anti-viral, anti-inflammatory and anti-bacterial constituents, as well as chemicals capable of preventing muscle cramp, reducing blood pressure, enhancing immune function, relaxing the nervous system and improving digestion, to name but a few.